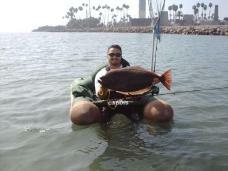 Float Tubing is fast becoming a popular way of fishing for both fresh and salt-water anglers. The closeness to the water, stealthy approach, and having access to waters sometimes not reachable by shore or even boat, gives float-tubers some clear advantages over anglers fishing from a boat or shore. There are currently 3 different types of float tubes on the market today, each with distinct advantages and disadvantages. There is also a whole "slew" of float tube accessories too. Some are necessary, some are conveniences, and some are junk. On this page, we'll try to cover on some of the basics of what you need to get floating and on to catching! First and foremost, we need to be safe on the water. There is always an element of danger present whenever you are on the water and float tubing is certainly no exception. Below is a list of proper safety equipment needed and some simple rules to remember so you will have a safe and enjoyable time on the water. 1. Life Jacket - You will need a good Life Jacket or PFD (Personal Floatation Device) in case you become separated from your tube or something happens to it and it can no longer support you. Most lakes require you to have one while tubing anyway so you will need one. Choose one that is, of course Coast Guard approved, but also one that is comfortable and not too bulky. Here is where you certainly "get what you pay for" so sometimes it's worth it to fork over the extra bucks. Remember that you're going to be wearing it all day so if it's not comfortable in the store, it's certainly not going to be after five hours of fishing! 2. Loud Whistle or Noise making device - Required on some lakes and especially necessary if you are tubing on waters where there are motor boats. 3. High Visibility Material - Some lakes require you to have 144 square inches of international orange visible at least 12 inches above the water line. An excellent idea so you will be more visible to power boaters. I have seen bright orange wader suspenders that work well for this. Whether the water you are fishing requires it or not, it's always a good idea to wear some bright clothing if you are tubing where there are powerboats. 4. Swim Fins - You may be wondering why are swim fins part of the safety equipment? A good pair of fins allows you to maneuver the float tube properly. Without them, you could be forced out into open water or hazardous areas by sudden winds and currents. Kicking with your feet and paddling with your hands may not be enough to get back to shore safely. (You're really not going to have much fun without fins anyway) Remember to purchase the proper fins depending on what type - if any - waders you will be using. 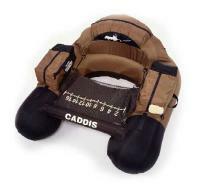 For boot waders you will need the strap-on type fins, and for stocking-foot waders you can use regular diving fins. 5. Anchor - A good tool for holding you in one position during high winds and currents. 6. Wide Brim Hat and Sunblock - There's no shade on the water. Having these items will definitely make your day more pleasant. 7. Drinking Water - Bring a little to stay hydrated. Don't drink too much or you'll be wasting a lot of time getting back out of the water and lugging your gear to the bathrooms. Stay Close to shore - Especially if there are powerboats on the water. Some lakes require float tubers to stay within 150 feet or less from shore. Also, try to stay close to where you have parked, launched from. It's all too easy to allow the wind or currents to drift you down a bank and suddenly before you know it, you are a mile or more from where you need to get back to. Often times I have seen float tubers stumbling along the shoreline and lugging all their gear because it is too exhausting to try to paddle-kick back to the car. Tube with a Buddy - Probably the most important rule you can remember. It's not wise to float tube alone where nobody can see you. Now that we have the proper safety gear and know how to float tube safely, we are ready to start looking at float tubes! There are basically 3 types of float tubes. Tube or "Doughnut" type, U tubes, and the Pontoon type. Everybody has his or her personal preferences on each. Here we'll try to give you a good description and some pro's and con's on each. Doughnut Type - The least expensive of the three and the most stable. It's kind of bulky having the tube in front of you and it makes it hard to reach your feet if you happen to get your line caught in your fins or need to adjust them. Also the hardest to get in/out of. "U" or "V" Tubes - Easier to get in/out of and generally more comfortable to fish from. Not quite as stable as the doughnut type. 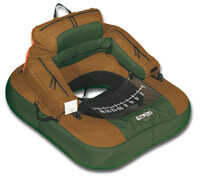 Pontoon Tubes - Puts you higher out of the water for more comfort and mobility. Glides through the water faster than other tubes. More storage area for fish finders and other gadgets. Some are equipped with oars for fast, efficient travel. They are the least stable of the three. They are also large and bulky which makes them difficult to carry out of the water. OK. We have our safety gear and float tube, now let's get some accessories! There are lots of gadgets to go with a float tube. Listed below are some of the things you may want to get. Waders - Some lakes require the use of waders and in some waters, it's just too cold to enter without them! You want to get a good pair of waders that are chest high. Most waders are made out of either rubber or neoprene. Rubber ones work fine but can get hot and uncomfortable, especially in warmer waters. Neoprene waders are generally more expensive than rubber ones because they are made of a breathable material. They are more comfortable and come in various thicknesses, depending on the temperature of the water you are fishing in. The other thing to think about with waders is whether to get the stocking-foot or boot-foot waders. Stocking-foot waders allow you to use regular diving fins, which are more comfortable and efficient than the strap-on boot type fins. However, with the stocking-foot waders you will need some type of shoes to wear while walking on land and entering the water. Boot type waders will allow you to walk across land above and below the water without fear of damaging the waders. Rod Holders - Great for using two rods or when you just want to give your hands a break! You can also position the rods at different angles which work much better than the stock Velcro straps on most tubes. Fish Finder - Yes, they have AA battery powered fish finders for float tubes. If you're the type who has to have it all then you need one of these! Back Pack Straps - Helpful for carrying your tube when hiking long distances. Tow-able Live Bait Tank - Kind of bulky but sometimes live bait can make the difference between getting bit and not. I'm thinking about getting a float tube, just wondering how fun it is, and is it worth the money? RB, it's definately fun and you'll even get some excercise too. I've been tubing now for over 12 years and it's a great way to relax when you're up in the Sierras on a small lake that doesn't allow motored boats. Total peace out there on the water and definately worth the money. 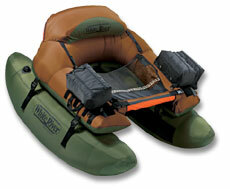 You should read through the Float Tube/Kayak boards for more info. Last edited by Trout-Tuna-For.Me; 12-05-2009 at 09:55 PM. All I can say it GET ONE! That way I will have someone to fish with all the time with my tube, plus it is WAY BETTER than shore fishing. You are missing out on some nice fish!